Bulk SMS Software Professional specifically designed to send thousands of text messages from PC to any cell phone via using GSM or Windows based handsets. Simply type your sms using system keyboard and send to all national or international mobile service networks without using internet gateway. Friendly GUI interface and easy mobile connection wizard assists you to quickly communicate with your family, friends and relatives by sending seasonal greetings, jokes and other stuffs in form of sms. SMS marketing software facilitates user the fast way to reach the target audience located worldwide and helps company executives to keep in touch with customers, office staff, or suppliers. Utility is widely useful for different commercial organizations (like Retail sectors, Banks, Educational institutions, Real estates, Financial sectors, Insurance companies, Telecom sectors etc) to boost up the business performance. Software helps marketers to engage with new customers and increase sales and services of the organization. Text messaging software is compatible to all GSM and Windows based mobile phones of well-known brands like HTC Touch, Palm Treo, HP iPAQ, Samsung, Motorola, Nokia, i-mate, Asus, T-mobiles, Sanyo, AT & T mobiles, LG, Sony Ericsson etc. Send group sms to individual or multiple mobile phone recipients in no time. Easily type text message from PC and send to multiple phone numbers. Easy way to connect mobile phone with the PC/Laptops. Option to eliminate duplicate number entries. 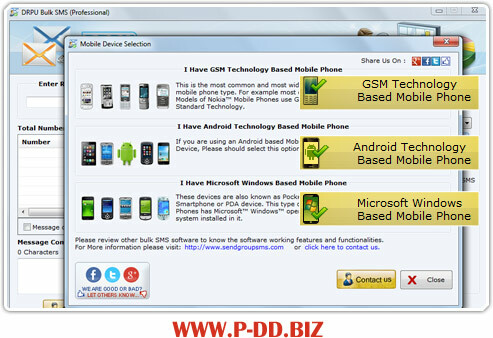 Supports all GSM or Windows based mobile phones. No hidden cost, renewal charges or any installation fee. No internet connection required for sending text messages. No expert guidance required to operate the software. Interactive and easy-to-use text messaging wizard. Cost-effective, flexible and simple bulk sms software.